There are some Christians who are awake to what is going on, but there are many Christians today who believe everything is just fine. Everybody loves everybody else. The Christians, Mormons, Jews, Jehovah's Witnesses, Moslems are all serving the same God, but in different ways. If I asked, "Can you partake of the Lord's Supper with Catholics? "They'd say, "Why not?" Let's find out if there is a difference between the Lord's Supper and the mass. Before I go on, let me explain that the bread, or wafer, used in the mass is called the host. When the host has been consecrated and offered as a sacrifice in the mass, it then becomes the eucharist. I am going to try to put into everyday language what is one of the great motivating forces behind the Roman Catholic Institution. It is the eucharist. I call it the little Jesus cookie. I know Catholics are going to be offended by this, but I can't help it. The Protestants have to realize where they stand on this thing. "If any one shall say that Christ, the only begotten Son of God, is not to be adored in the holy sacrament of the Eucharist, ... and that He is not to be publicly set before the people to be adored, and that His adorers are idolaters, let him be accursed!" PERPETUAL ADORATION -Two Benedictine Sisters at the Convent of Perpetual Adoration kneel before the Blessed Sacrament exposed in a monstrance in the convent chapel. Whether at work or at prayer, the nuns focus their lives on Jesus present in the Eucharist. 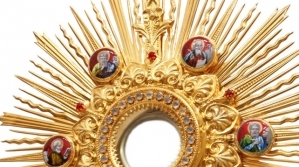 That's when, beloved, the priest walks out holding up the cookie in the monstrance, which looks like a sunburst, and people come up and kiss it and adore it. And if any Protestant would say, "Hey, that's idolatry," that Protestant is to be accursed. Now, to sum this up, the Roman Catholic Institution teaches that you must believe that the bread, or host, consecrated in the mass actually becomes Jesus Christ and it is to be worshipped as God Almighty. This is why, back in 1554, a priest carrying the eucharist (the little Jesus cookie) could stand before a family of Christians in Scotland, tied to posts with dried brush up to their waists. He'd hold that piece of bread before them and ask if what he held in his hand was actually the body, blood and deity of Jesus Christ. When they said, "No, it is only a symbol," the priest's assistant placed his flaming torch into the brush and set those Bible-believers on fire. As the victims screamed in agony, the priest held up his crucifix and said, "All this is for the greater glory of God." The Eucharist in the monstrance being carried in a procession. It holds firm, just as strong today, as it did in the time of the Middle Ages, that anyone who ridicules it, or says that it only represents Christ, is damned. The Vatican II Council re-affirmed this. Pope John XXIII said, "I do accept entirely all that has been decided and declared at the Council of Trent." That Canon law is in effect today, beloved.